An overview of Omega's limited edition pieces for this year's Rio 2016 Olympic Games, with pricing details. Omega, as some might have known, has been the official timekeeper of the Olympic Games for 26 times since 1932. This means that with the upcoming Rio 2016, it will be their 27th time participating in the competition. For this wonderous occasion, Omega had specially launched three limited edition models for this year’s Olympic Games in Brazil. For this edition’s novelties, Omega had decided to incorporate the colours of the Olympic into two of the three timepieces. These colours, notably, can be found on the famous “Olympic Ring”. They include blue, black, yellow, green, red, and white (which is derived from the background). The only exception in this collection is the Mark II, in which it is more subdued in its colour scheme as compared to the rest of the watches. The Speedmaster Mark II Rio 2016. This version is slightly different from the original variant, with a little twist. We start off with the most serious timepiece amongst the latest novelties – the Mark II RIO 2016. The Mark II RIO 2016 features some modifications, although it is pretty subtle at the first glance. For those who are more observant, one would have recognized the rings of the sub-dials that were finished in bronze, silver, and gold. These are the same metals that are featured on the medals which are presented to the top three sportsman/sportswoman in each of the individual sporting events during the competition. 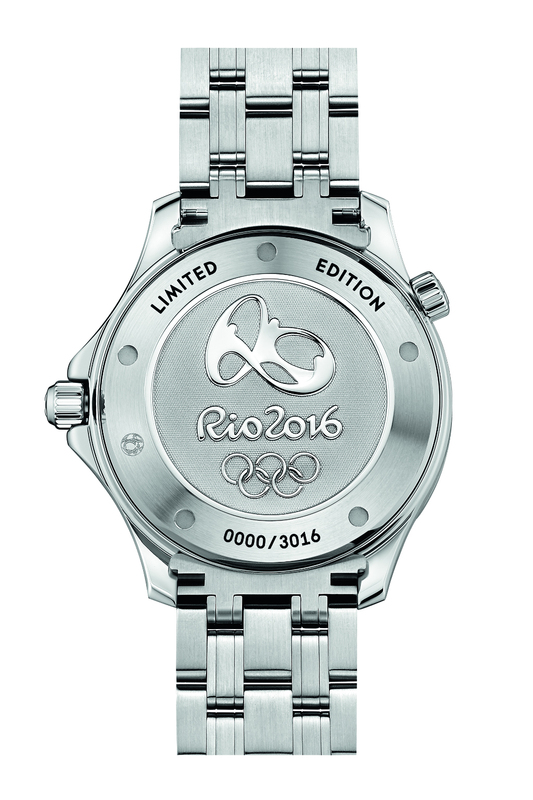 The special caseback on the Mark II RIO 2016. Besides that, the other difference is that this watch is fitted with a special caseback. 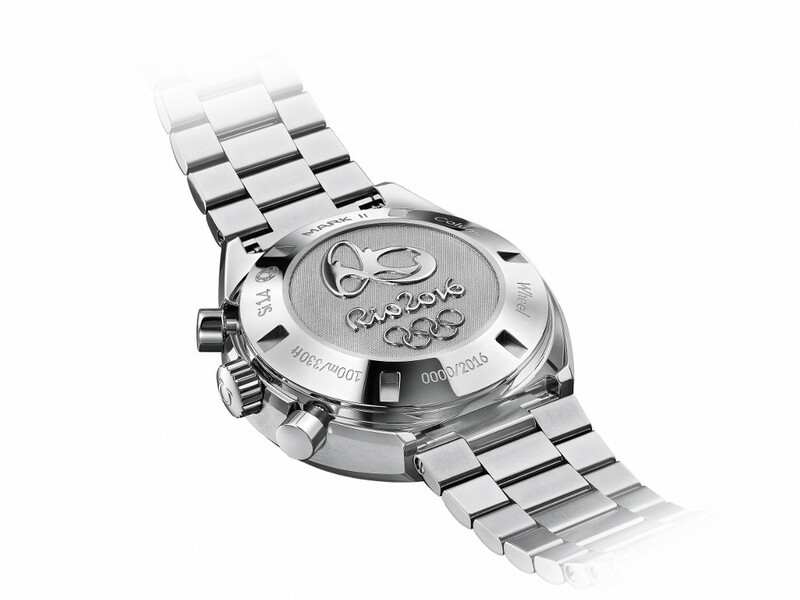 It features the logo of this year’s Olympic Games, instead of the usual one that contains the Speedmaster emblem. The watch number will also be engraved on this caseback itself. In terms of mechanics, the timepiece is still powered by the Co-Axial Calibre 3330. This automatic movement features a chronograph, as well as a date display. More details of the mechanics for the Mark II can be found in the article here. There will only be 2,016 examples of the Mark II RIO 2016 available, and they are priced at SGD 8,400 each. The limited edition Seamaster “Rio 2016”. 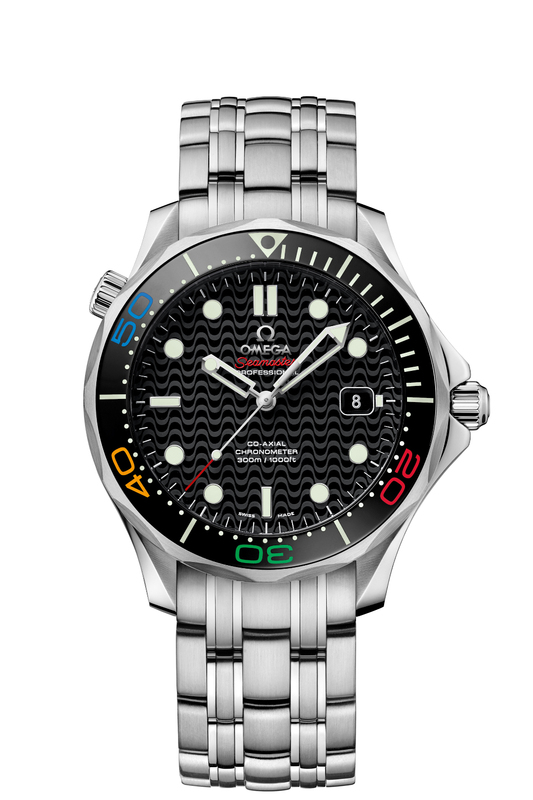 This one is a tad more colourful than the usual, which makes it a lot more interesting than the standard dive watches. Moving on, we have something that is more vibrant and colourful. The Seamaster Diver 300m “RIO 2016” Limited Edition, as seen above, is fitted with a rather intriguing-looking bezel. Unlike the usual variant, the polished black ceramic bezel on this particular piece comes with coloured lacquered numbers. The colours, naturally, are the same ones that we have seen on the Olympic Ring. It adds an interesting touch to the timepiece, and it certainly makes this tool watch a tad more fun and less imposing than its usual counterparts. Also, Omega had done some tweak to the signature “Wave Dial” that had adorned many Seamasters. The dial on this particular piece features the wave design of the Portuguese pavements along Copacabana beach. The special caseback found on the limited edition Seamaster. Similarly, this Seamaster is fitted with a special caseback to commemorate the Rio 2016 Olympic Games. In addition, each caseback is numbered individually. The watch is fitted with Omega’s Calibre 2500, an automatic movement that features a date indicator. It costs SGD 6,300, and it will only be limited to 3,016 pieces. 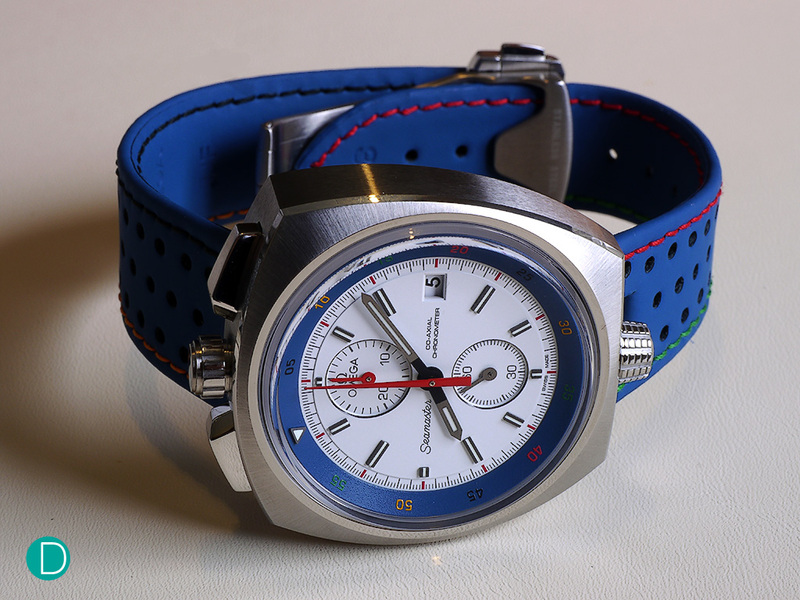 Finally, we have the Seamaster Bullhead “Rio 2016” Limited Edition, with the signature Olympic livery. The Bullhead, amongst the three pieces, is the most striking timepiece in this special collection. What makes this watch stand out is not just the rotatable internal bezel that features numerals with the Olympic colours. It is the eye-catching blue racing strap, completed with red, blue, yellow and black stitching. The colour combination of the strap and the internal bezel, together with the white dial, is definitely a conversational starter. Combine these elements with the iconic bullhead case, which is already pretty uncommon to begin with, and you will end up with a timepiece that is rather mind-blowing. As mentioned in our review article, this limited edition Bullhead is fitted with Omega’s Co-Axial Calibre 3113. 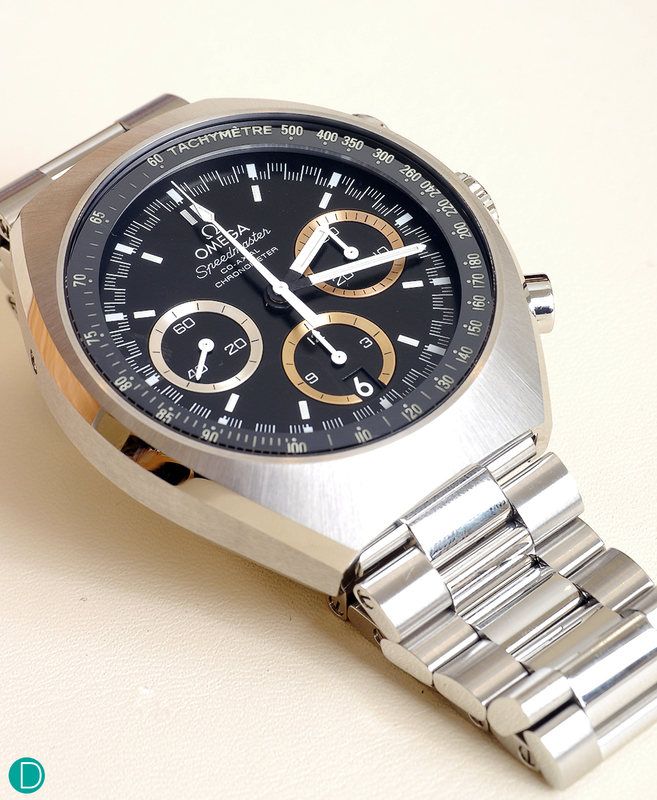 This is an automatic movement featuring the chronograph function, as well as a date indicator. 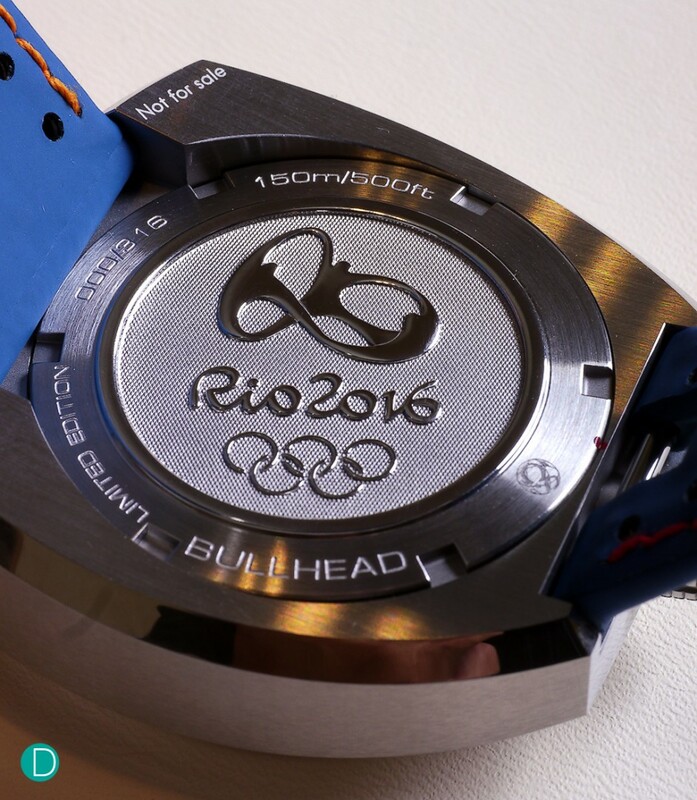 The Bullhead is limited to only 316 pieces, and each of them is fitted with the special “Rio 2016” caseback. It will be priced at SGD 12,400 each. Personally, we like the Mark II “Rio 2016”, for we think that it is not too loud and it can be rather versatile. We love how Omega had incorporated the three different metal (bronze. gold, and silver) into the rings of the sub-dial, and thus paying tribute to the Olympic Games in a subtle but meaningful way. The Bullhead, we reckon, will also be a good watch to have for a casual outing on the weekends. We love the latter for its vibracy, although we feel that its colourful nature will restrict the amount of wrist time the watch is going to get. So, what is your favourite piece from this special collection? 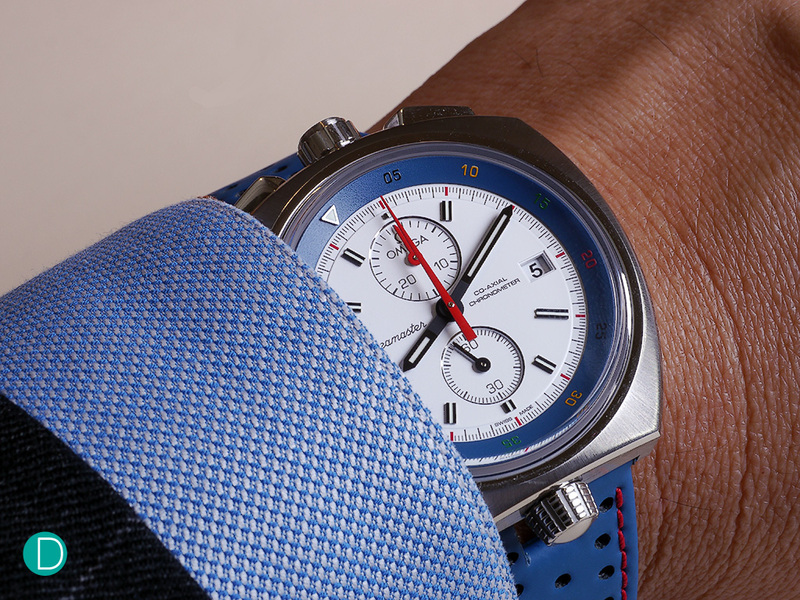 Do you prefer the more colourful options like the Seamaster and the Bullhead, or the slightly classic Mark II? Let us know in the comments section below!